JKBOSE class 12 exams postponed, revised dates yet to be announced. The curfew in the area remains put. Class 12 Jammu Summer division dates for the exams starting March 1 to remain as is, till further notice. JKBOSE class 12 exams: The Jammu Kashmir Board of Secondary Education (JKBOSE) has postponed the exams for class 12 scheduled to be held on February 23 and 26, 2019. On February 26, general English exam was scheduled to be conducted while on February 23, candidates had to appear for Geography/ Psychology/ Geography/ Music/ Philosophy/ clothing for the family exam. The exams for class 12 students appearing from summer zone, Jammu division only are being postponed. 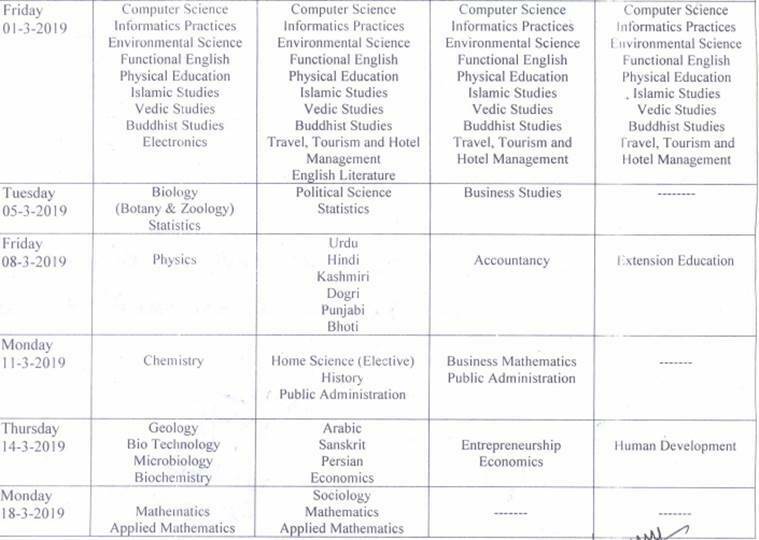 JKBOSE is yet to announce the new dates for these exams. According to the circular released on the official website, jkbose.ac.in, exams scheduled to be conducted post-March 1, 2019 will continue as per the previous notification. While the cause of behind the postponement is not yet revealed by the board, it is to assume that the same has been done because of the tensions prevailing in the area after the Pulwama attack. At present, the region is under curfew. The dates for the postponed exams will be declared later by the JKBOSE on its official website, jkbose.ac.in.